by Bill Dwight on Friday, September 14, 2012 at 6:46 PM | LEAVE A COMMENT! This week’s round-up runs the gamut from credit cards to clothing budgets to chores. But there is a common thread: not underestimating our kids. Kids can understand subtle concepts. They can take ownership over their spending and accept consequences without whining. They can take initiative to help the family. My favorite quote in the article is of course: “Many financial professionals say the best way to teach students about financial responsibility is to give them hands-on experience before they head off to college.” True dat! Related FamZoo Activity: Give kids hands-on personal finance experience early with a virtual family bank. 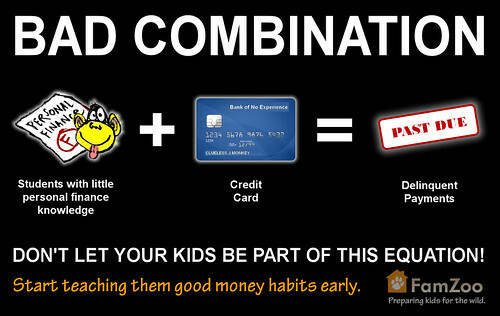 Speaking of early and credit cards, parents need to realize that kids are a lot more savvy than we tend to think. Out of the blue, my 10 year old asked me how a credit card works while walking to school yesterday. We talked about how it differs from paying with cash, and how it’s basically a loan with really, really nasty penalties for paying late. We talked about merchant fees (“Why does the Noodle House only accept cash?”) and rewards programs (“Is that where you get all your free coffees?”). We talked about the difference between a credit card and a debit card. We talked about how people get into really bad debt problems when they spend irresponsibly with credit cards. As much as I like to think my kid is a genius, he’s a pretty typical 10 year old. He totally got all the concepts and had some really interesting questions (Q: “Couldn’t you actually make money off a rewards program?” A: “Yes, if you’re disciplined!”). We’re talking about a 10 minute walk here. Wouldn’t it be cool if every kid knew the pros and cons of credit cards starting at age 10? Try the discussion. They can handle it. Do you have a teen who is really into clothing? There’s a good discussion here in BakersfieldMom about establishing a clothing allowance for teen girls, whether it should be monthly or annual, how much is reasonable, etc. A monthly budget/allowance can work just fine, but I’ve had good experiences with annual. It’s an eye opener for the child (and some parents!) to construct the annual budget and see just how large that number gets with seemingly reasonable choices. It’s a great way to learn how to manage a pretty large sum over a long period of time — which requires some discipline and thinking ahead. The key is that your child has to live with the consequences of blowing a chunk of the budget early. Despite what the family psychologist councils in the article, I found there was really no whining in this case, because my daughter participated in making the original budget and therefore felt and took ownership. 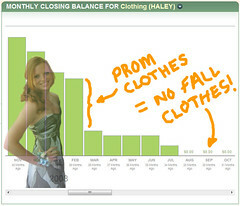 Related FamZoo Activity: Create a clothing budget with your teen. Here’s an interesting little twist on the chore chart: an “Initiative Chart.” Instead of a mandated enumeration of chores with associated rewards, it’s a set of suggestions for taking initiative and helping the family during segments of the day. I love the fresh, thoughtful philosophy. Check it out here. 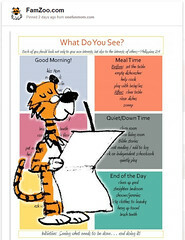 Related FamZoo Activity: Create an online chore chart. Leave off the amounts to make it an initiative chart! We’re constantly scouring the Internet looking for articles related to family finances and teaching kids good personal finance habits. You can visit our ever growing list of family finance bookmarks here. We’re up to 2,857 now!